A curious collection of portraits by Sanja Jankovic. Most wine lovers "eat with their eyes." We see the grape color, gauge the opacity, and scrutinize the rim. Serbian artist Sanja Jankovic eyes with her eats. That is, she uses wine to paint pictures. Visit her website or Facebook page and you can see how she tackled everything from family portraits to classic Renaissance paintings to modern celebrities. With minimal brushstrokes, she brings to life characters like Game of Thrones' "the Hound" (Sandor Clegane played by Rory McCann)—her favorite character—and Tyrion Lannister (Peter Dinklage). Check out how the texture of McCann's hair and beard contrast with his armor, marvel at the surprisingly smoldering seductiveness in Jankovic's Marilyn Monroe, and note that her Mona Lisa manages to retain the enigmatic smile—a detail that, if fumbled, can make the lady look unintentionally dopey or menacing. Like any oenophile, Jankovic has to know her vintages, if only to keep her colors consistent. Grapes can interact with the canvas in different ways—red wines offer blues, purples, and browns just as white wines run the gamut from yellow to gold to light green. At the very least, she needs three color tones. Her go-to varietals: Riesling, Chardonnay, and Sauvignon Blanc for white and Merlot, Pinot Noir, and Cabernet Sauvignon for black. White wine, it should be noted, can also function as a solvent. Jankovic, who studied painting in school, happily sells her paintings online, most of which sit on a 35 x 27 cm canvas. Interested parties can make requests by email; contact info lives on her Facebook page. And while most other people complain about wine spills, Jankovic can't get enough of them. 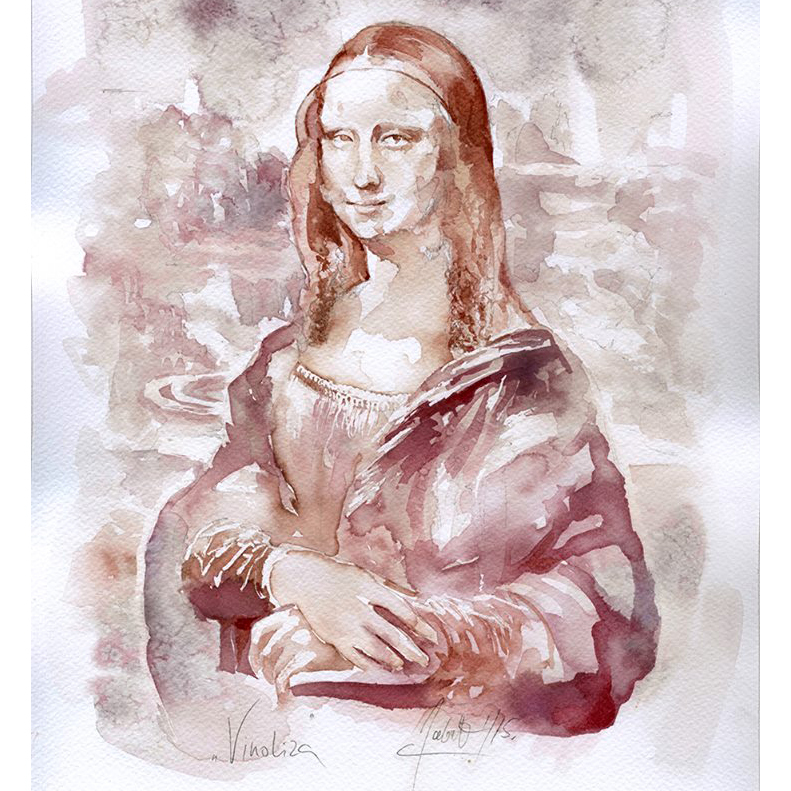 "Wine paintings are made of well-controlled wine stains," she says. "[I have to] try out a small sample of wine on paper and observe pigment quality and how it acts after a certain amount of time."